This walkthrough will describe the process of creating your accounts for the RYAA website. You will need to create accounts for each parent and player that uses the system. The parent accounts MUST be created first! This creates the proper linking between the parent and player accounts that allows the registration and management systems to work together. 1) Visit the RYAA website and click either the "Register Now" button or the "New RYAA Member Registration" button. 2) On the New Member Registration page, click the "Begin Registration" button. On the following "New Member Registration" page, click the Continue button. 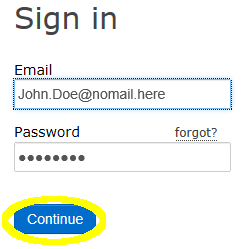 3) Enter your email in the field provided and click the "Create my account" button. You will soon receive a message from ryaasports.org containing a link to enter a new password for your account. If you do not receive the email, first check your Junk Mail or Spam folders. If you still cannot find the email, please email our website administrator at . 4) Click the link provided in the email. A new page will open in your browser. 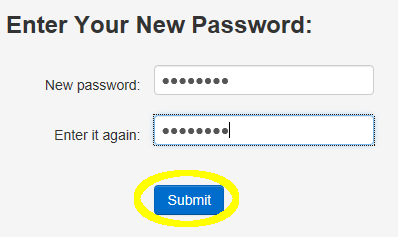 Enter a password in the "New Password" and "Enter it again" fields, then click the Submit button. If the passwords match, you will see a "Password Reset" screen, just click the Close button. 5) Return to the sign-in page on www.ryaasports.org, enter your email address and password and click the Continue button. 6) You will now be at the "New Member Registration" form. Enter the information for your PARENT account first. Click the Submit button at the bottom of the form when finished. 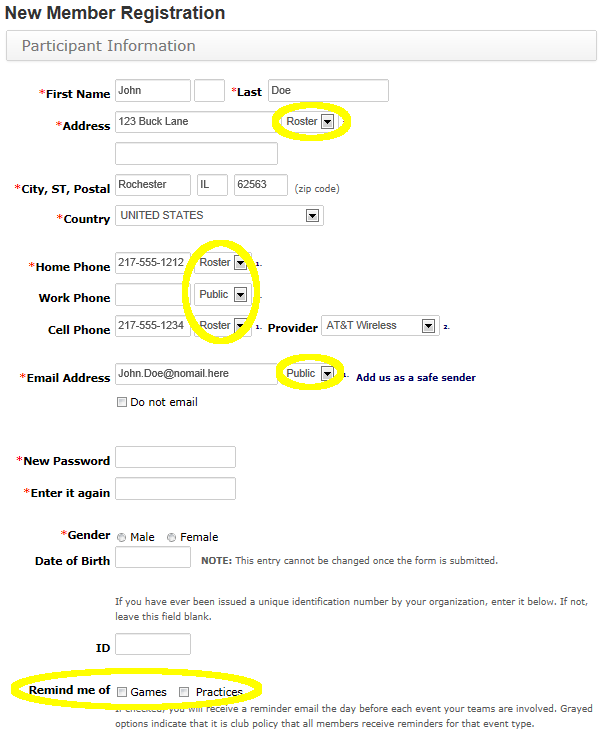 To receive notices of games, practices, and changes to your teams schedule, be sure to check the boxes at the bottom of the form following the lable "Remind me of:"
If you wish to receive text alerts as well as email alerts, be sure to select your cell phone company in the Provider field. Following the Address, Email and Home/Work/Cell Phone fields, there is a dropdown box that will set the privacy level of your contact information. Roster means that only the assigned team can view the information. This is our recommended setting. Public allows anyone to view the information. RYAA cannot set the default privacy level, it is up to each individual member to control their privacy settings. 7) In the "Registration Review" window, click the "Back to Registration" button. From here, you will have the opportunity to add one more parent account and player accounts for the children you wish to register in RYAA programs. The registration form is the same as in step 6. Player accounts need to have a date of birth and grade level to confirm program eligibility.